If you perform a detailed audit of your operation, chances are good that youll identify a number of ineffective practices. Rooting out these inefficiencies can transform your warehouse into a lean and efficient operation and help you reduce costs while improving service to your customers. The authors perspective is not only on short-term cost reduction, but also on long-term process improvement that adds value for your firm and your customers. 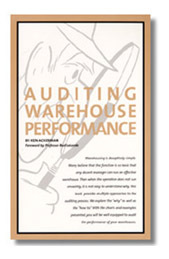 Auditing Warehouse Performance is guaranteed. If you are not 100% satisfied, you may return it within 30 days for a full refund.